← Messed it up and made it again…Monday. …it’s not that I don’t want to finish it. It isn’t that I’m perplexed or perturbed. The thing is, I kinda like this guy hanging over my landing. It adds color to my very large, very white walls. We’re going to paint (we even have a contractor now!) just not today. 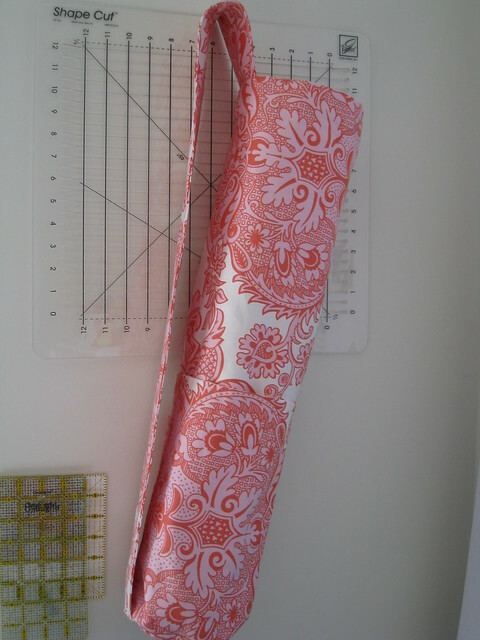 So, instead of finishing my quilt top, I put together my yoga mat bag. I bought the fabric almost a month ago (You know those purchases, the ones at 2am when you just HAVE to make something!) and it has been calling my name ever since then. There are a variety of things that have stopped me but they aren’t interesting so I’ll spare you! I used this pattern (scroll down to almost the end) from Amy Butler’s website and the Sandlewood fabric from her Love Home Dec collection. I do believe I will be the most stylish girl at yoga tomorrow morning! I was surprised at how easy this was to put together! 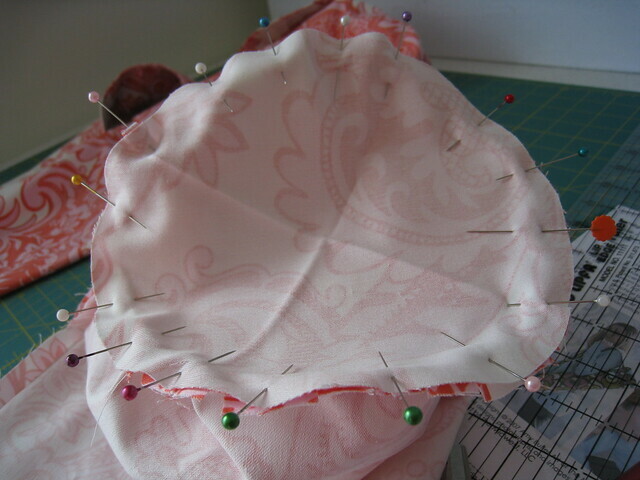 I’ve never sewn with her home dec fabric before and the “twill sateen” was really great to sew with. Check that. I broke a needle (in THREE pieces! ), cussed, realized I needed a jeans needle and THEN it was great. On a semi-related note, has anyone ever WASHED any of the Love home dec fabric? Does it matter or am I going to kick myself for not pre-washing? Perhaps I just need to resign myself to the fact that my yoga mat bag may be dry clean only. I also (re)confirmed that I hate circles. I did better than I usually do, but that may be due to an over abundance of pins… Whatever works, right? That’s it! Ta-daaaa!!! I’m psyched! I love my bag (it even has pockets!) and I can’t wait to use it. Unfortunately, I don’t think I can be finished just yet, though. I have my own eye pillow (handmade, of course) that I’ve been using a for a while and now I don’t think it is cute enough to hang with the new bag. I may have to remedy that situation before class tomorrow! 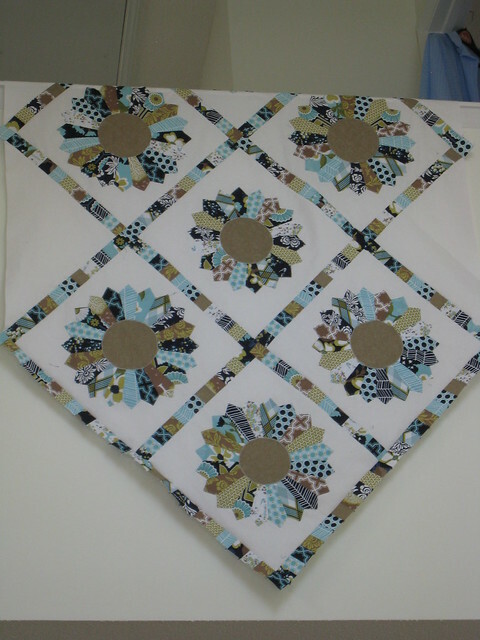 This entry was posted in Finished Projects 2011, General Happiness, Other Sewing and tagged finished projects 2011, yoga, yoga mat bag. Bookmark the permalink. I’m so impressed with your skills! I love the quilts hanging on walls. I hope you put it back up there after the paint! Super fantastic…can’t wait to hear how heads turn when you walk into class with your new bag! Totally agree. Your dresdens look gorgeous up there. Wait until the paints ready to go up and then take it down and finish it. Love your yoga bag. Are you going to make more? One for each mat?